The Invergordon Archive - Any ideas? If the sign reads "Fort Rauch" (rather than Ranch) this may be a PoW camp. Try googling "Fort Rauch" - I got 2 links one relating to Stalag XII Posen. This is a PoW camp in Poland outside Posen. It was a fort built by the Germans in the Franco-Prussian War, 1871. I have a picture of my father in the same place. memories of life as a PoW and much to tell. I hope that you will contact me. George Beeson, author of Five Roads to Freedom, went through this POW camp. Tremendous story. Alan Forster, my father's youngest brother, was also at Fort Rauch from 1941-4 and I have borrowed his letters home and am transcribing these with a view to publishing them on the web and, perhaps, as a book as I worked in publishing until my recent retirement. 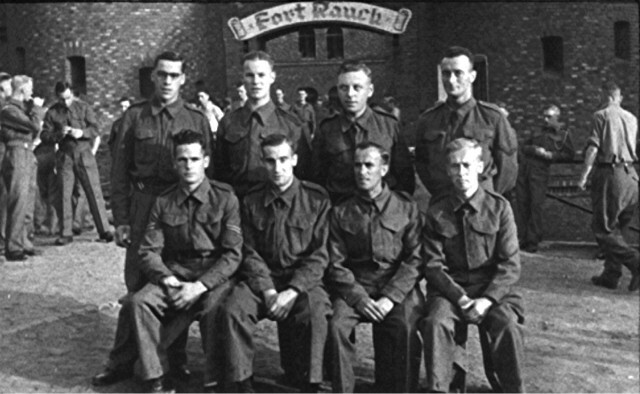 I also have about 50 photographs taken at Fort Rauch and sent home with letters by Alan and two of his friends and fellow prisoners, Charlie Glasgow and Phil Goold. One is also similar to this. I would be very pleased to receive any further information you and others may have. I can be mailed direct at: bill@fischer-balcke. de (my wife is from Hamburg). Mrs. Lesley Williams, please contact me! Your e mail address doesn't exist. Do you have alternative mail? My name is Kamil Nowak. I made a web site about Klimontow which is a quarter of Sosnowiec (Upper silesia-Zaglebie, POLAND). There used to be German labour camp for 400 prisoners of war from Great Britain (1943 - 1945). I'm sure that one of them was your father Howard Powell. The full name of camp was: Kommando E 702 Stalag VIII B 344 Lamsdorf. I know your email address from Bill Forster whose uncle Alan Forster also was Klimontow's prisoner. Your father and Alan probably lived in the same room. Alan Forster wrote very interesting diary about his times in Poland during World War 2. I will be very grateful if you could ask your father about his times in Poland. Does he has photos or documents from Klimontow? some information I wrote in English. I think that your father should remember some places in Klimontow esp. our coal-mine.